Meet Hoi; a man as wise as he is friendly. 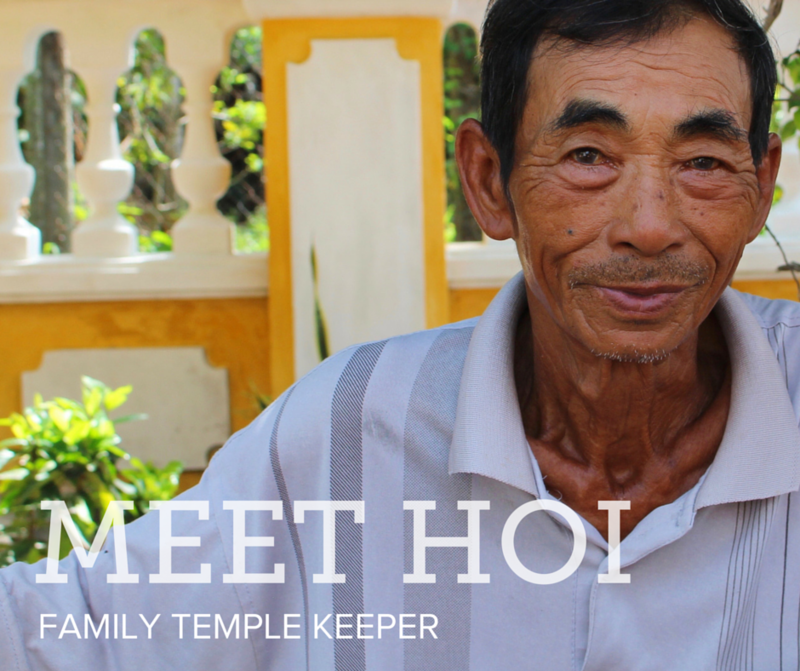 At 80 years old, Hoi is the full time keeper of his family’s ornate and colorful temple, or ancestral house. 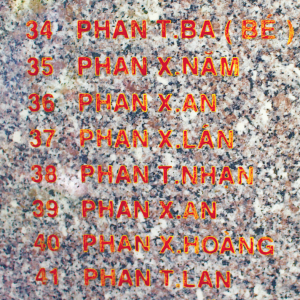 The Phan family temple has thrived for 15 generations, and Hoi is of the 13th. Hoi spoke fluidly and without sadness when he told Phi, my awesome tour guide and translator, that when he passes away, this duty will be taken on by the next generation, that being his younger brother. Hoi explained that this 200-hundred-year old temple comes alive every year on the 10th of February when the family gathers for worship and celebration. The celebration is paid for by the married grandsons of the family. The men are given a free pass after their first year of marriage, but by their second year of marriage, the man must offer 50% of their share. After the third year of marriage, the man is expected to pay their full share. If the man does not have the means, he is welcome to ask other family members for monetary support. Come the celebration, it is customary for the family members to make a donation to the temple. This donation is based off of wealth, so they may offer as little or as much as they feel they can provide. 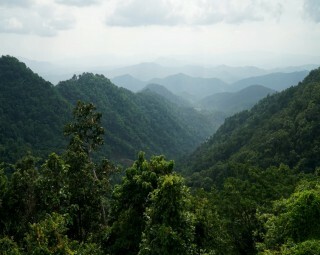 Poorer family members are encouraged to donate anything that could be of use, such as fabric or bamboo (a material used for an abundance of things in Vietnam). As was implied by Hoi’s description of traditions and worship, family is the core of life. The wealthy therefore look after poor. This is why, following the celebration, the donations given to the ancestral house are shared with family members in need, and to their education. The range of donations as well as the donors names can be seen on a marble wall inside of the temple. 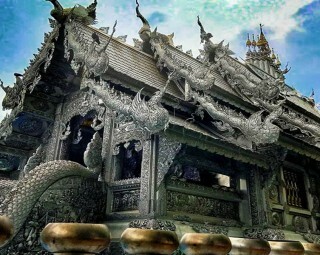 Hoi described the temple as significant for three principal reasons. For one, the temple is a place for the family to worship their ancestors. Secondly, this sacred temple preserves the family tree. Finally, the temple is a symbol of protection. 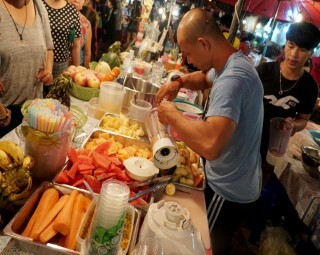 On my first day tour of Hoi An, Vinh, my tour guide, joked that these once a year celebrations are very important for meeting everyone in the family. He said you could meet a wonderful and handsome young man or woman on the street and exchange the standard, “What’s your name? How old are you? Are you married? Do you have kids?” Vinh joked that you may find one another attractive only to realize at the annual celebration that you two are cousins. Families are large, and Hoi An is not, which means it’s not unlikely you could meet a family member and be completely unaware until the annual family temple celebration. The idea of protection was reinforced by everyone I spoke with at the Phan family temple. A woman cutting a leaf from a thick stem in front of the temple to wrap the morning glory she would soon sell in the market explained the power of the garden beneath. 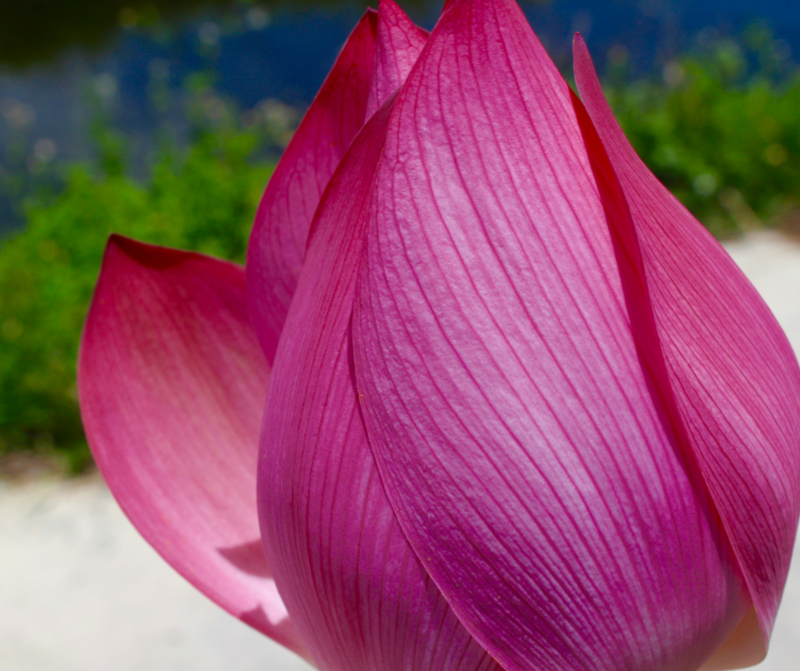 The feng shui, she described, gives harmony to the people and the environment, and the lotus flowers offer constant protection for the Phan family. The woman said that because you are surrounded by good, you will learn to be good, and you will do good. 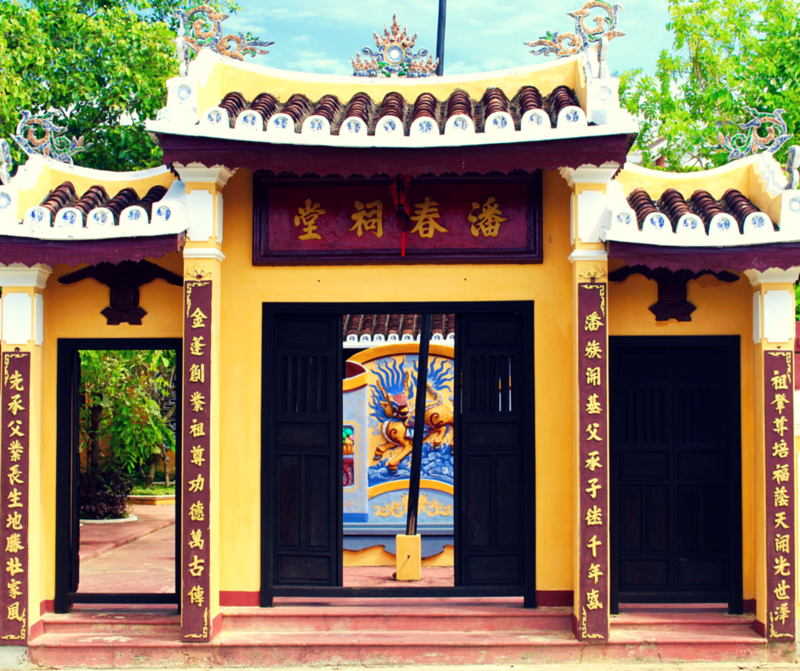 Although the men are predominantly worshiped in Vietnamese culture because they are understood as the ones that preserve the family tree by passing on the family name to younger generations, there is a shrine dedicated to the unmarried women of the family. At the center of the shrine are offerings for the respected godmother of the sea. These women are perceived as stern, yet powerful individuals that are constantly looking out for the family. Every year at the annual celebration, offerings are made for these women in the form of lights, flowers, and candles. 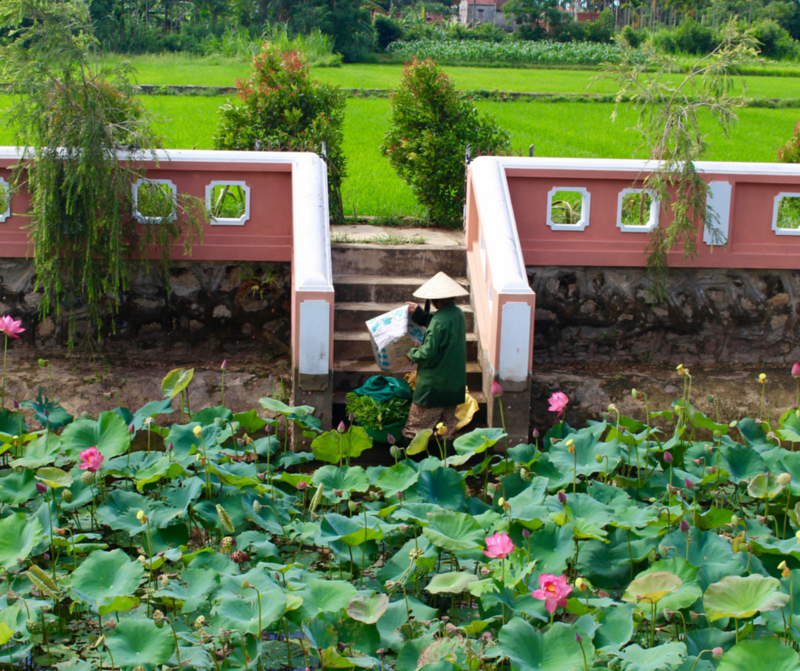 This Vietnamese cultural event is one that leaves your mind full and your body hot. No need to overpack though, our tour guides store cool towels and water bottles in your vintage vespa to keep you comfortable. 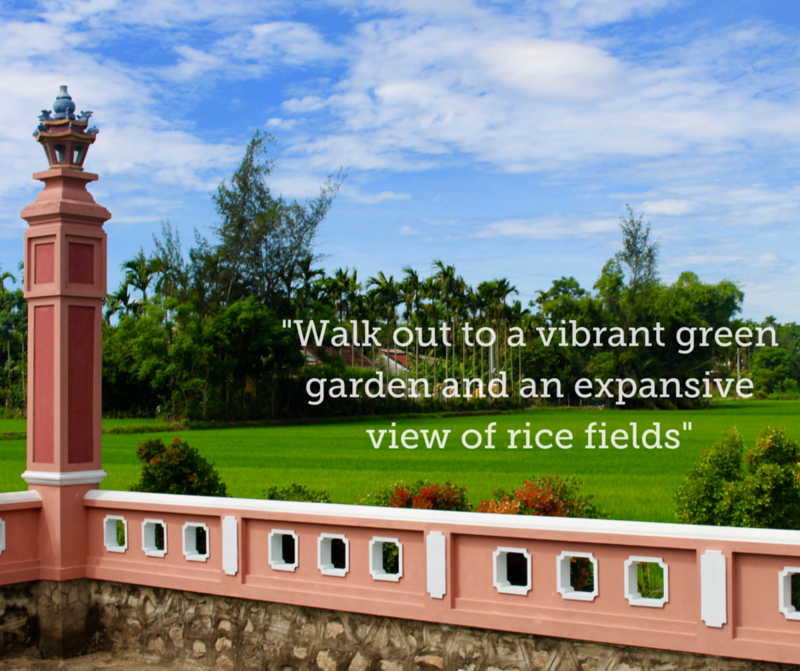 When you exit this magical temple, you walk out to a vibrant garden, an expansive view of rice fields, and lucky for me today, a shining sun and light blue sky.